Decks are subject to all types of weather—heat, rain, snow, wind—all of which can lead to premature aging and damage. 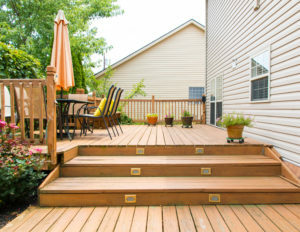 If your deck has started to show the effects of extreme weather and aging, our team at Annapolis Brothers can help restore its former beauty. 100% Customer Satisfaction Guaranteed. Is your outdoor living space in need of some improving? Just like the rest of your home, your patio also deserves and needs maintenance. Try our deck washing services today to get your deck back in shape. We have the right equipment and knowledge of how much pressure is needed to get your deck clean. Deck Wash & Stain Annapolis Works With the Following Surfaces & More! Every few years or so our deck and patio can begin to wear out and look aged. A quality stain and sealer, will penetrate the wood grain to seal it, while also allowing moisture to escape from the wood. It won’t chip, peel or crack. The more tinting the stain has, the better protected your deck will be from fading and moisture. With our staining techniques we can provide a high quality deck reviving service. We proudly offer professional deck sealing services that are quick and efficient so that you can get back to enjoying your outdoor space as soon as possible. We know how to restore decks in all stages of disrepair. Whether you need minor deck restoration or complete sealing services, you can trust our highly-trained team. If you need further home maintenance assistance, we are #1 Gutter Cleaning Annapolis.